Russian Imperial Amber Easter Egg with bronze onlay of Tsar Nicholas II and Imperial Eagle. Russian Traditional Tea Glass Holder podstakannik. Very rare. Russian Traditional podstakannik. The Cup holder is cast on design sketch. and traditional Russian tea party. Tea Glass Holder. which shows the harvesting of tea leaves. Quite unusual-the use of faceted glass as a desiccant. In the glass poured salt to the Windows are not frozen. Faceted Drinking Glass Russia Water Glass Clear USSR. The most well – known use-is cutting with it blanks for dumplings. Coat of Arms USSR. Tea Glass Cup Holder - 1 pcs. Tea Glass Holder. Glass NOT INCLUDED. I do the combined sending goods. Condition : The item is in good condition for its age, and did not have any repairs. Typical silver “Tea Glass Holder SADKO” with Cyrillic maker's mark and hallmarks. Stamped with the Russian Hallmarks. Mat, glazed and gilt decoration. A solid, relatively heavy piece in superb condition! Marked on bottom: State Porcelain Manufactory Moscow, in red. Also, impressed (model number?). Antique/Vintage Brass/Copper Hot Water Samovar Urn Set-Multi Hallmarks-Russian? Pot stands approx 23" high x 9 1/2" across handles. There are a total of 9 pieces. The spigot key, lid, crown, & tea bowl are all in excellent condition with no dents.The tray is dented & shows a lot of wear. Condition good. Smirnov # 1101/б. Dyakov # 1206.2 (R2). This publication presents a profound study of brilliant works of Danko sisters, Natalia and Elena. Danko Sisters' Works. Владимир Левшенков. Творчество сестер Данько. Th century Russian silver candlestick from. The candlesticks with square base and bulbous form stem. The entire candlestick is beautifully hand chased with floral decorations. Condition: excellent. Securities Of Imperial Russia. The book is on sale without it. Лифлянд, Ю.А. Век акций, рент и облигаций. Ценные бумаги Российской империи. By L. Lifland, Yu. Moscow, 2005. FROM AN ESTATE SALE ON THE NORTHERN COAST OF CALIF. AND A UNIQUE ITEM. There is a little gold paint missing from the plate and a small crack on the back. Russian Silver (Georgian?). Hallmarked 84 H (see photos) silver Crown and Scrolled Initials K G. Condition: Very good condition for the age. Small chip of wood missing from corner of the hinged part. Antique Russian Sterling Enameled Egg w/twist wire Cloisonne, 24 ½” Chain. 20th. Never used. Excellent condition. These traditional Russian tea cup holders in 24K gold plated silver were used by Russian royalty and nobility in the past centuries. Indeed, the delicate, rich, shiny design is fit for a Tsar! Circa 1914. Condition Excellent. Size H 3 5/8" x D 2 3/4". Pitcher H 8" x D 5" x L with handle 8". 2002 Afghan War Rug Rare Afghanistan War Motif Rug 100% Wool Handmade 25 x 32 "
The battle between the Soviet Union and the Afghan mujaheddin inspired the creation of a new type of carpet that has been described as a“woven scar of war.”. The owner of this rug was involved with the Afghan resistance since the early 2000's. We have a variety of design, colors and prices. KEY CHAINS ARE SHAPED LIKE STACKING DOLLS. "Russian Imperial Moskow Spoon of using Niello and handcrafted technique”. It has no hallmarks. Russian Antique 84" Silver Spoon with the gilt and (Niello in silver, deep engraving, filigree, chasing, embossing. ). TRAIN WAGON SHAPE - Very unusual and very rare item. Text :INTERNATIONAL WAGON No.95, RESTAURANT. RUSSIAN ANTIQUE SHTOF VODKA BOTTLE 1 LITER FLORAL CUT ART GLASS 18th CEN. RARE! RUSSIAN ANTIQUE DECORATIVE "SHTOF" VODKA BOTTLE. FLORAL CUT ART GLASS 18th CEN. VERY RARE! TOTAL HEIGHT : 17 cm. WEIGHT: 761 gr. WIDTH: 7.5 cm. Biscuite, porcelain, painting, hand work. Made by Gardner manufactory, Imperial Russian. Original, from old collector based in Latvia. Russian Miklashevsky Porcelain in 2 vol_Фарфор завода А.М.Миклашевского в 2-х т.
Miklashevsky Factory Porcelain, in 2 vol. The Most Complete and Thorougly Attributed Catalog of Miklashevsky Factory Porcelain To Date ! Hardcover in Presentation Box, 250 x 345 mm. 424 140 pages. Dulevo Factory Mark 1937-1947. Condition Very Good. After the death of the owner, technical and artistic standards declined, and in 1875 the factory closed. POPOV MANUFACTURER, MID 19TH CENTURY. 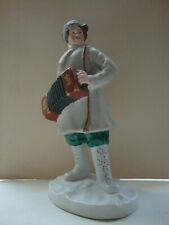 M anufacturer: Russian Imperial Porcelain, city of Moscow - “Popov” manufacturer. 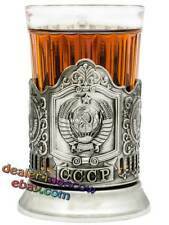 Th Century Russian Silver & Niello Cheroot artwork of famous Soviet silversmith. th century ( Niello Cheroot Russia village. Presented for sale set of 3 beautiful antique Russian Soviet spoons. Elegant Exponent of 20. ). Simple, utilitarian, with a depiction of the coat of arms of Russia, they were produced with small variations for use in all the imperial palaces. The Imperial Porcelain factory also producedservices for imperial yachts, which constantly shuttled between Petersburg and Peterhof and were stationed for long periods in the harbors of the Lower Park and Alexandria. Russian Traditional Tea Glass Holder podstakannik "RUSSIAN RAILWAY" + Glass!!! The stability of the glass on the table is also significantly improved. Country/Region of Manufacture: Russian Federation. We have constant access to various goods from Russia, don't hesitate to ask, We will try to help you find all what you want. Antique 18th century Russian silver cup. Total weight: 168 g. Height: 10.5 cm. 19th Century Imperial Russia / Poland Warsaw Large Bronze Silverplated Hallmarked Artistic Bowl Dish. Nice and rare piece for collectors. 100% AUTHENTIC. Actual pictures. Double your traffic. Russian Porcelain. The Art of the First Russian Porcelain Works. Estate sale find, a classic work on Russian porcelain, with text in Russian, English, German, and French.